For the former "Big Four" Railway company, see London, Midland and Scottish Railway. 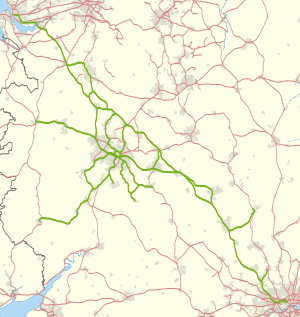 For the former British Railways region, see London Midland Region (British Railways). London Midland is a train operating company in England, owned by Govia, operating the West Midlands franchise. London Midland operate local services in the West Midlands and surrounding areas through their City sub-brand. They also operate long distance and commuter services on the West Coast Main Line through the Express sub-brand from London Euston to and from the West Midlands, Hertfordshire, Buckinghamshire, Bedfordshire, Northamptonshire, Staffordshire and Cheshire. 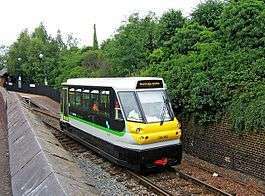 Additionally, services on the Stourbridge Town Branch Line operated by Pre Metro Operations are branded as the London Midland Stourbridge Shuttle. 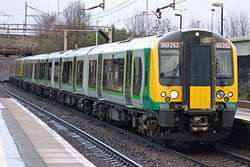 The franchise was originally due to expire in September 2015, this was extended to March 2016, and again to October 2017 after London Midland agreed to put on extra trains and improve services. 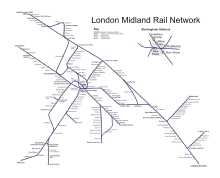 London Midland's services are divided between four groups of routes: London Euston Routes, Birmingham Regional, West Midlands Local and Branch Lines. London Euston Routes includes train services between London Euston and Birmingham New Street or Crewe, as well as services which only use a small section of the route (e.g. Northampton - Birmingham New Street). Birmingham Regional includes longer-distance, semi-fast services between Birmingham New Street and Hereford, Shrewsbury or Liverpool Lime Street. West Midlands Local includes stopping services through Birmingham to nearby settlements such as Lichfield and Kidderminster. Branch Lines includes services which operate on branch lines that are essentially separate from the rest of the network. Bordesley; 1 train per week on a Saturday, from Whitlocks End to Great Malvern, plus football specials. Polesworth; 1 train per day from Northampton to Crewe. Note: In the northbound direction this service is timetabled as two separate services, terminating/originating at Northampton. Most trains run to Worcester Shrub Hill, then reverse to continue to Foregate Street. Some irregular off-peak trains either terminate at Shrub Hill or run through to Foregate Street, avoiding Shrub Hill. Irregular service; approximately every 45 minutes. In December 2008 London Midland discontinued the direct service between Walsall and Wolverhampton. Traffic on the route was low, but growing, and there was a campaign to keep the service. 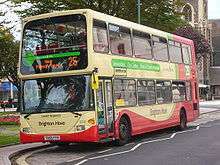 The service was a priced option with the new West Midlands franchise, but the Department for Transport decided not to provide funding from December 2008, and as a result the service ceased. There is only one early morning train on Saturdays from Wolverhampton to Walsall (Parliamentary service). London Midland advised that passengers should use National Express West Midlands buses instead. In December 2008 a two-hourly Worcester Shrub Hill to Gloucester was introduced to improve transport links between the two areas as well as to provide an increased service at Ashchurch for Tewkesbury. This service was withdrawn in December 2009 because of low passenger use. However, since the December 2009 timetable changes, London Midland still does run a (Parliamentary service) once a week from Birmingham New Street to Gloucester, in the southbound direction only with no northbound return. In October 2010 London Midland applied to the Office of Rail Regulation to run a new hourly Birmingham to Preston service from 2016 by diverting every other Birmingham to Liverpool train. The Euston to Crewe service would then be extended to Liverpool to maintain a half-hourly service between Crewe and Liverpool by 2016 as well. This was rejected by the Office of Rail Regulation. London Midland also sought to run additional evening and Sunday trains between Euston and Crewe, to satisfy what the company says is unmet demand. From April 2012 London Midland began operating an hourly Euston to Crewe service on Sundays. In order to win a contract extension, London Midland has agreed to put on extra services, resulting in an extra 6,600 seats per week. The company stated that it experienced many breakdowns due to the outdated rolling stock it inherited and which it has now replaced, and has also provided extra seats in the 2014 timetable. In Autumn and Winter 2012 many services suffered cancellations owing to a shortage of train operating staff. A new partnership agreement between London Midland and transport authority Centro is set to trigger a £10m investment in station improvements across the West Midlands. 'Transforming Rail Travel' is a deal between the two organisations to continue a two-year arrangement with the aim of delivering further enhancements to services and facilities. London Midland inherited a fleet of Class 150, Class 153, Class 170, Class 321, Class 323 and Class 350/1s from Central Trains and Silverlink. One of the major franchise commitments was the replacement of the existing fleet of Class 150s and Class 321s. Upon being awarded the franchise, London Midland ordered a total of 66 new trains of three different types, comprising two Class 139 Parry People Movers, 12 two-carriage and 15 three-carriage Class 172 Turbostars and 37 four-carriage Class 350/2 Desiros. All bar three Class 150s were cascaded to First Great Western (12 x 2 carriage, 2 x 3 carriage) and Northern Rail (18 x 2 carriages) and the Class 321s to First Capital Connect (13) and National Express East Anglia (17). The Class 153, Class 170 and Class 323s have all been refurbished. The first of the Class 350/2 Desiros arrived in the UK in early October 2008 for testing at the Siemens Northampton depot. By July 2009 they were all in service. 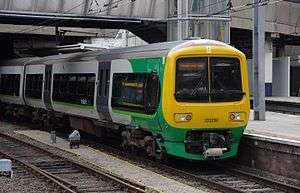 London Midland was to lose all of its Class 321s, but a change of plan saw it retain seven for use both on the Watford Junction to St Albans Abbey branch line and on peak-hour express services between Northampton/Milton Keynes Central/Tring-London Euston. The final seven units moved to Abellio ScotRail in 2015/16, and were replaced by seven Class 319s cascaded from Thameslink. 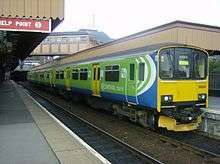 The two Class 139 railcars were due to enter service on the Stourbridge line with the start of the new timetable on 15 December 2008. However, problems in testing caused a delay in their introduction, with a replacement bus covering the route following the reallocation of the Class 153 originally used. The two railcars finally entered full passenger service in June 2009. London Midland was to lose all of its Class 150s, but a change in plan saw it retain three Class 150 vehicles as additional capacity, following a statement from the Department for Transport on 10 August 2011. However, London Midland transferred two Class 153s to First Great Western as a result. The other Class 150s were transferred to First Great Western and Northern Rail. In 2011 London Midland announced that it would be procuring a further 18 four-coach Class 350 Desiros, eight for itself and ten for sub-lease to First TransPennine Express. In February 2012 it was announced that 20 Class 350 Desiros had been ordered by London Midland. Ten Class 350/3s entered service with London Midland, and ten lClass 350/4s with First TransPennine Express. The franchise agreement included the option of replacing the three remaining Class 150/1s in the fleet with six Class 153s in June 2017. The Northern franchise agreement indicates this option has been taken up, as the London Midland Class 150 units will transfer to Northern in 2017. The Northern franchise agreement also rules out the option of any additional Class 323 trains being leased from Porterbrook to London Midland before 1 January 2019. In July 2016, London Midland and the West Midlands Combined Authority announced that it would run a year-long trial of the prototype Vivarail Class 230 DMU on the Coventry to Nuneaton Line. Tyseley depot in Birmingham maintains London Midland's diesel fleet of classes 153, 170 and 172 units. Soho depot in Smethwick maintains London Midland's Class 323 units (purpose built for the 323 units when new). Kings Heath Siemens depot in Northampton maintains London Midlands class 319s and 350s. The Class 139s have their own small depot where all maintenance is carried out at Stourbridge. Worcester depot is used for light maintenance and stabling of diesel traction units for both London Midland and other operators. Trains are also stabled (when not in service, refueling or undergoing maintenance) at Leamington Spa, Birmingham New Street, Coventry, Bletchley, Watford, Camden (near London Euston), Shrewsbury, Wolverhampton and Crewe (in relation to train crew or other operational requirements). In April 2016, the Department for Transport announced an Abellio/East Japan Railway Company/Mitsui consortium, Govia and MTR Corporation had been shortlisted to bid for the next franchise. The Invitation to Tender (ITT) was issued in August 2016, with the franchise due to be awarded in June 2017. The successful operator will begin services in October 2017. In July 2016 it was announced that MTR Corporation had withdrawn from the bidding process. 1 2 Operated by Pre Metro Operations on behalf of London Midland; services are branded as London Midland. ↑ "London Midland wins franchise extension". Railnews. 3 December 2015. Retrieved 13 December 2015. ↑ "Our Network". London Midland.com. London Midland. Retrieved 2 June 2009. ↑ "Save Wolverhampton to Walsall Rail Services". RMT Union. Retrieved 2 June 2009. ↑ "Black Country rail service faces funding axe". Birmingham Post. 25 July 2008. Retrieved 2 June 2009. ↑ "Lack of passengers brings cut to service". Worcester News. 4 September 2009. 1 2 Miles, Tony (December 2010). "Blackpool through service proposed in West Coast path frenzy". Modern Railways. London. p. 6. ↑ Application for Section 22A amendment track access agreement. London Midland application. ↑ "Faster and bigger trains on London service". Lichfield Mercury. 31 March 2012. ↑ "London Midland welcomes new contract award". ↑ "Improving our services". London Midland. 2010. Retrieved 1 June 2011. ↑ "London Midland reveals new timetable and additional seating across network". Birmingham mail. 2014. Retrieved 11 December 2014. ↑ "London Midland staff shortages cancel trains". BBC News. 2012. Retrieved 2 October 2012. ↑ "More London Midland trains hit by driver shortage". BBC News. 2012. Retrieved 27 October 2012. ↑ "London Midland driver shortage hits 37 trains". BBC news. 2012. Retrieved 1 November 2012. ↑ "Performance London Midland". London Midland. ↑ "Performance Network Rail". Network rail. ↑ "£10m investment in West Midlands transport". Insider Media Limited. 30 September 2013. Retrieved 14 September 2014. ↑ "Siemens unveils Desiros for London Midland". Rail (603). Peterborough. October 2008. ↑ "London Midland's 321 trains get a fresh coat of paint" (Press release). London Midland. 11 June 2009. ↑ "London Midland to introduce more seats for London commuters" (Press release). London Midland. 1 October 2009. ↑ "Delay to new Class 139 Parry People Mover service" (Press release). London Midland. 5 December 2008. ↑ "The fleet's in! Class 139 enters service at Stourbridge" (Newsletter). Parry News. Parry People Movers. July 2009. ↑ Samuel, A. (15 September 2011). "New rolling stock for London Midland & First TransPennine Express". Rail.co. ↑ "Extra trains and faster journey times will boost capacity" (Press release). Department for Transport. 29 February 2012. ↑ "London Midland's new trains bring extra capacity and faster journeys" (Press release). London Midland. 29 February 2012. ↑ Gillman, Alice (22 July 2016). "Class 230 to enter passenger service this year". Vivarail. Retrieved 22 July 2016. ↑ "DfT issues West Midlands franchise ITT".